A reporter shows the news about journalists who were detained by Myanmar military, in the Democratic Voice of Burma (DVB) news room in Yangon, June 29, 2017. When three journalists were arrested last week after reporting in territory held by an outlawed rebel group in northeastern Myanmar, government officials were quick to blame the journalists. The charge in this case is a section of the Unlawful Associations Act, a colonial-era statute that could mean jail sentences of up to three years each for The Irrawaddy reporter Lawi Weng and the Democratic Voice of Burma’s Aye Naing and Pyae Bone Naing. There has been rising concern about the deteriorating state of press freedom in Myanmar and the reluctance of Aung San Suu Kyi’s new government, which came to power last year, to challenge the army over rights abuses. But as the journalists await their first hearing on July 11, media groups are busy poking holes in the legitimacy of the military’s case, arguing the three had been cleared to cross into the territory and the charge makes no sense in connection with coverage of newsworthy events. Aye Chan Naing, the Democratic Voice of Burma’s chief editor, told VOA the journalists were in a convoy to visit the Ta’ang National Liberation Army (TNLA) in northern Shan State late last month when they stopped at a military checkpoint and turned over reporter ID cards and identity documents. The account could not be independently verified, but it could be a crucial point in the defense’s case. Aye Chan Naing believes the journalists ran into a different army unit on the way back. “So there could be a miscommunication between these two checkpoints,” he said, adding the account comes from two separate sources. Four civilians were also arrested, though information about them has been scant. Rights groups say the charge, article 17/1 of the Unlawful Associations Act, is aimed at putting a wedge between the civilian populace and ethnic armed groups by criminalizing many forms of support for them, including attending meetings and “in any way assisting” their operations. The TNLA is one of several armed organizations fighting for more autonomy in Myanmar, and despite attending peace talks in the capital in May, it has not signed a cease fire agreement with the military. 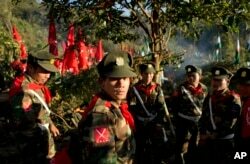 FILE - Officers with the Ta’ang National Liberation Army gather in the steep hillside jungles in Mar Wong, a village in northern Shan state, Myanmar. Aye Chan Naing added it would be difficult to argue the journalists had assisted the cause of the group in any way. “We haven’t even managed to make a story yet after they returned,” he said. Rarely has the controversial legislation been applied to members of the media, who have been reporting openly and objectively in conflict areas for nearly five years, since Myanmar launched a series of reforms as part of a still-unfinished transition to democratic rule. Myint Kyaw, a member of Myanmar’s Press Council, which handles complaints about media coverage, said the organization sent a letter to army leadership pointing out the discrepancies between the charge and the actual purpose of the visit. The Committee to Protect Journalists has condemned the arrests and called for the journalists’ immediate release. Since Aung San Suu Kyi formed a government in April 2016, freedom of expression has taken a hit in Myanmar, with most cases involving charges of online defamation for articles and Facebook posts that impugn the civilian government or the military. With the arrests in Shan State, media monitors worry about further restrictions on the free flow of information and ideas. The military public information office in the capital, Naypyitaw, declined comment about the case, referring calls to the Press Council. But Myint Kyaw said the Press Council has been unable to reach the army. He said the legal aspects of the case did not matter so much, as the judiciary in Myanmar lacks independence. “That’s why we are worrying about this,” he added.